I know I am putting this post up a few days early... but I wanted to get the main post taken care of a little early as I am playing with the first post a little trying out new ideas. Suggestions Welcome. With Halloween being my all-time favorite holiday... I like to celebrate it all month long. So every year at this time I have a month long horror / Halloween marathon. Every year I try to beat my record of most horror movies, horror or Halloween episode TV Series and now Other (Shorts/Documentaries). The best I ever done was 2 years ago when I watched 100 Horror Movies, 45 TV Show Episodes & 2 Other. The only thing I was able to do last year due to circumstances beyond my control was to watch 4 Other. Will I be able to beat my best record... I really don't know. To be honest I will be surprised if I do. But that is ok... as I plan to give it my all whether it is a win, loose or a draw! And no matter what happens I am going to have a great time! In this thread you will find all my reviews for this year's marathon. And in this opening post you will find how well I am doing on my goal. CLICK HERE and you will find a quick link guide to all my reviews for this marathon. It is too late, my blood is in your veins. When I first saw this thread I thought you have given in to temptation! Feeling a bit antsy are we? After over 100 days going without horror I really want freedom to watch any type of horror that I like on the first day! So I decided to make the first day be Unwatched DVDs. Below I will list the horror movie I have on DVD that I haven't watched yet. I may have seen the movie before... but not since getting it on DVD. NOTE: There is many movies I never heard of here. So they may or may not truly be horror. Especially many of those many contained in the 50 and the 100 horror movie boxsets that I have. If there is any you know for sure can not be considered horror let me know and I will delete them from the list. 74. Dr. Phibes Rises Again! There is definitely a select few I am really looking forward to watching on the 1st... but any of the above should be fair game. Once again if there is any above that you know not to be horror please let me know. Less then a week away... so preparing. And antsy is not the word for it! A creepy, darkly comic celebration of the scariest night of the year from producer BRYAN SINGER (director of X-Men and Superman Returns) and writer-director MICHAEL DOUGHERTY (co-scripter of X2 and Superman Returns ). 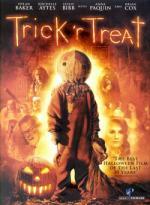 Trick 'R Treat takes the Creepshow/Tales from the Crypt approach to nefarious new depths with four interwoven tales set on Halloween night: a high school principal (DYLAN BAKER) moonlights as a vicious serial killer; the quest of a young virgin (ANNA PAQUIN) for that special someone takes a gruesome turn; a group of teens carries out a cruel prank with disastrous consequences; and a cantankerous old man (BRIAN COX) battles a mischievous trick-or-treating demon. This is one of the ones I was really looking forward to seeing... as I always loved anthology horrors. While it is technically an anthology horror... it isn't the way I know anthologies at least. Instead of having 3 or 4 separate short stories along with a wraparound storyline... this one is done more like a regular movie with all the stories intertwined with each other. While not bad... I prefer the traditional format of an anthology. Now with that said... I did enjoy all the stories in it... even though I did have some of the stories figured out ahead of time. I liked the one with the girls finding dates. That storyline has Anna Paquin in it... who I find adorable. I have enjoyed her since I first saw her as Sookie in True Blood. I normally don't go for blondes... but in the case of Anna Paquin I think she looks better as a blonde. Over all I enjoyed it quite a bit. Think it was a good start to my marathon. Academy Award® winners Anthony Hopkins* (The Silence of the Lambs) and Benicio Del Toro** (Traffic) tear up the screen in this action-packed thriller. Lawrence Talbot (Del Toro) is lured back to his family estate to investigate the savage murder of his brother by a bloodthirsty beast. There, Talbot must confront his childhood demons, his estranged father (Hopkins), his brother's grieving fiancée (Emily Blunt, The Devil Wears Prada) and a suspicious Scotland Yard Inspector (Hugo Weaving, The Matrix Trilogy). When Talbot is bitten by the creature, he becomes eternally cursed and soon discovers a fate far worse than death. The 1941 Wolf Man has always been one of my classic horror movies. So when I first found out they were remaking it I felt a mixture of excitement and apprehension. I always though the trick to a good remake was to change enough to give us a new take on the story... but at the same time make it similar enough to do the original version justice. Which can be very hard to get the right balance. In the case of The Wolf Man I think they did a pretty good job at achieving this balance. Even though there was some things changed in the story that I didn't care for... but there were some things that I also did care for as well. One thing I am thrilled about is they kept the classic look of the Wolf Man. Over-all I enjoyed it quite a bit and glad I finally have it in my collection. I told you so, didn't I? Yeah... and if I did... I would have never heard the end of it! I love that Pete's marathon started at exactly midnight! Now Kathy... did you really expect any different? Unholy terror is unleashed in the skies when a deadly, genetically engineered virus is released onboard a transatlantic flight to Paris in this heart-stopping thrill-ride of terror! When a scientist on the run from the CIA manages to smuggle a contaminated body onto a commercial overseas flight, the plane becomes an incubator for a quickly growing army of the undead. With a zombie invasion spreading through the cabin, only a handful of passengers remains to fight off their fellow travelers and land the plane before it's too late. Even when I decided to get this one... I knew it would be one that I couldn't expect much from. So I went into this with very low expectations. And I think it was a pretty good idea I went into it with such low expectations. This is not what I would call a good movie. I was able to enjoy some scenes... but over-all I found it to be a bit lackluster. It really took quite a bit of time to get going. And most of the characters I just couldn't get myself to care about. Also... while I can't put my finger on it... the zombies felt a little off to me. But once this movie got going it had some decent zombie action/gore. But over all it is just an average zombie flick. I can see myself watching it again... but not as often as some in my collection. This extended unrated version of the hit thriller Darkness teams award winner Anna Paquin (X-Men ) with Lena Olin (Hollywood Homicide, Chocolat) and Iain Glen (Resident Evil: Apocalypse, Lara Croft: Tomb Raider) as a family whose life forever changes when they move into a new home with an ancient secret! Not long after Regina (Paquin) begins living in her family's remote country estate, she learns that there's something horribly disturbing about the old place. Even as her parents dismiss her concerns, strange things begin to happen whenever the lights go out. Soon Regina realizes that a series of escalating supernatural events will unleash the full evil that resides in their house...and once it's released you'll experience it like never before in this scarier, more shocking unrated version! While looking through my unwatched DVDs... I spotted this movie. Another one I never seen with the adorable Anna Paquin (Sookie on True Blood). This one also has another familiar face with Lena Olin who was in a good handful of episodes of Alias. This one tries hard to make a good atmospheric movie... unfortunately it fell short for me. While not a terrible movie as it does have it's moments... I found myself watching the clock almost as much as I was watching the movie. Well... that is the last one for me today. I am rather disappointed in myself. I was hoping that I would get several more watched the first day. But unfortunately real life got in the way of all my fun today. Hopefully tomorrow will be better.